In this week's edition of The Bleacher Briefings podcast, we recap the NBA Finals, discuss what teams could prevent the Heat and Thunder from repeating as conference champions next season, and take a closer look at the proposed system that could change the landscape of college football forever! - Miami Reigns Supreme: In a highly competitive series, the Heat managed to knock off the Oklahoma City Thunder in five games to claim the Larry O'Brien Trophy. 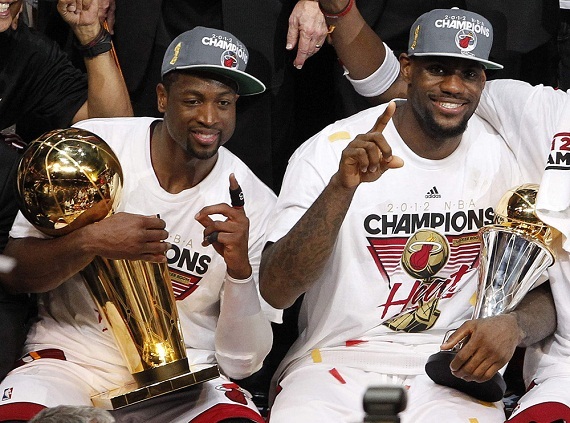 What were the deciding factors that helped LeBron James claim his first championship? We'll tell you. - 2012-13 Season Crystal Ball: It's never too early to start looking ahead to next season, so we take an in-depth look at the teams and players that could possibly prevent Miami from repeating as NBA champions. - New Day in College Football? : On Tuesday, university presidents will formally suggest a four-team playoff to replace the current BCS format. Is this where the new system will end, or is it only the beginning? Our answers might surprise you. - Mail Time: We answer listener email questions, including -- who is under the most pressure to win a title now that LeBron finally has one, what big name NBA player is most likely to find a new home during the offseason, and what our thoughts were on Boston trading third baseman Kevin Youkilis to the White Sox. Pretty good podcast guys. This was my first time listening. The song at the start of the podcast sounds familiar. What song is that?